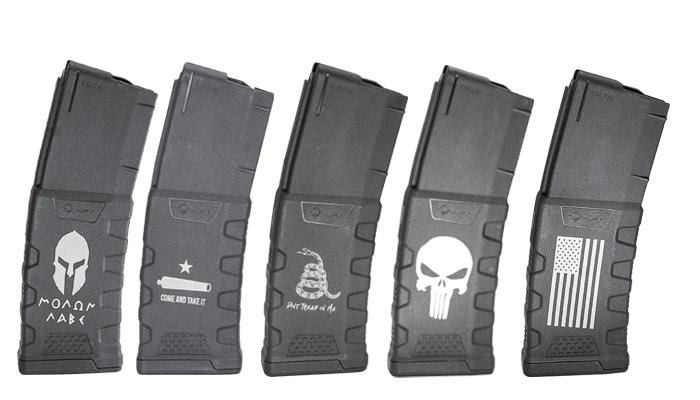 For the 2018 holiday season, MFT’s EXDPM556 magazines will feature five unique patriotic decorations, available only through Academy Sports + Outdoors. Horsham, Pa. (December 2018) –Mission First Tactical, LLC (MFT™), a leader in USA-made rifle/carbine accessories, will be offering five exclusive patriotic engraved Extreme Duty 5.56 Polymer Magazines (EXDPM556) only through Academy Sports + Outdoors during the 2018 holiday season. Using the newest material technology and manufacturing, MFT’s Extreme Duty magazines are constructed with next generation long glass fiber polymer, offering enhanced strength, durability and stiffness. Although designed for the AR15/M4 platform, the Extreme Duty magazines can be used with a wide range of non-AR15/M4 platforms. The newest addition to the MFT line of high performance, extreme warrior magazines also boast a ribbed gripping surface on the front and rear, an oversized bolt-catch, flared floorplate, paint dot matrix for identification and requires no tools for disassembly with its double floor plate safety release tabs. The five exclusive patriotic Academy Sports + Outdoors MFT Extreme Duty magazines include: the Spartan helmet ‘Molon Labe;’ the ‘Come and Take it’ cannon and star, commemorating the firing of the first shot of the Texas revolution on Oct. 2, 1835 near Gonzales, Texas; the Gadsden flag ‘Don’t Tread on Me;’ the Punisher skull and the American flag. MFT Extreme Duty 5.56 Polymer magazines are built for hard shooting and extreme treatment and shooting conditions and come with a Lifetime Warranty. Battlelink™ Buttstocks, Engage™ Pistol Grips, React™ Grip Series, Torch™ Laser & Light Mounts, E-Volv™ and MFT Mags™ brands are trademarks of Mission First Tactical, LLC. All company and product names mentioned herein are trademarks or registered trademarks of their respective sources.